The deceased’s wife and daughter were with him at the time of the accident. The body was transported to Tortola under the watchful eyes of the Royal Virgin Islands Police Force and is now at the morgue at Peebles Hospital, in Road Town, waiting on official determination of death. Police Information Officer Diane Drayton when contacted today November 30, 2015 said that she would get back to this news site once she is debriefed on the matter. However up to post time she had not made contact with this news site. French Tourist died on Anegada this morning! THE SETTLEMENT, Anegada, VI - Our newsroom’s correspondent on Anegada in the Virgin Islands has reported that a French tourist died on Anegada this morning November 29, 2015. Police on Anegada from the Royal Virgin Islands Police Force are still investigating the circumstances surrounding the death of the male tourist. 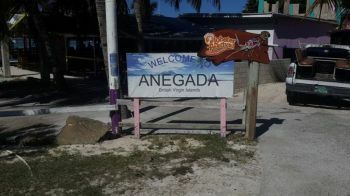 Anegada is currently in the last day of the three year old Lobster Festival that began yesterday November 28, 2015 and will end today November 29, 2015. It is unclear if his death is related to activities associated with the Anegada Lobster Festival. On Friday as part of the event there was a Lobster Crawl, a night of bar-hopping and dinning along the beach. Our newsroom will bring more details on the death of the visitor as soon as more information becomes available. We cant handle no more bad publicity at this time. Watch out because right now france is on the edge. OH ! Shut up ! Someone loses their life and you talking nonsense. Hope when you get what you pray for . You can stand it. My condolences to the family. Its the rough seas did he not see the warning flags? So sad.. Check your health status before you go to party. Your sugar your cholesterol your pressure. So you know what to eat and drink and what not to. ( Im just saying ). Knowing may just save your life. Too many people dying off these cruise ships. T Board need to educate them about the culture, ocean and beaches etc. Anegada used to have the most wonderful people on the earth!!! !What happened? ?